From the moment I stepped out of the bus, I was shaking with excitement and I could feel the nervous knot in my stomach start to grow tighter and tighter. 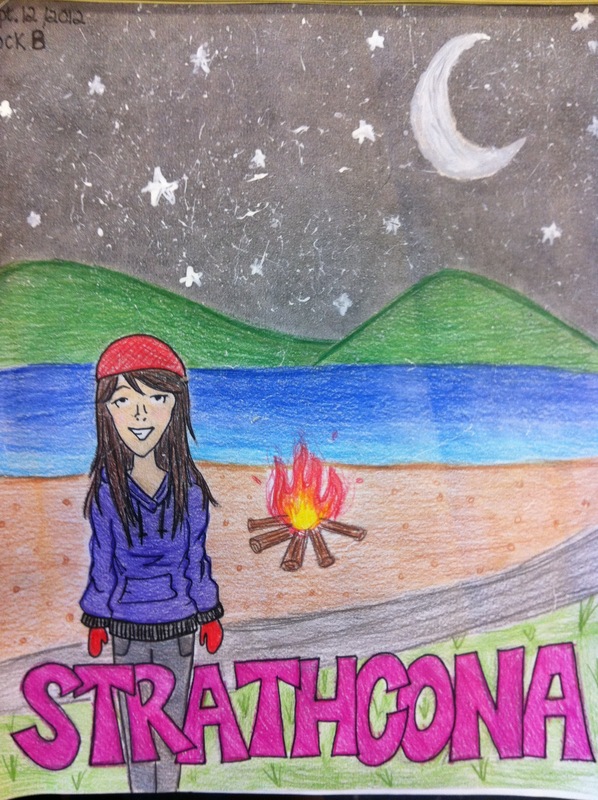 My first impression was that everything at Strathcona was so clean and natural. I was really impressed by how eco-friendly the camp was and how all the food was organic and healthy. What I really liked about paddling with my group was that we were so in sync, our strokes matched almost perfectly and we glided through the water so smoothly… About half-way through our journey I started getting a bit frustrated because my muscles started to ache and our group was starting to slow down, but I was really proud because we pulled through and made it to the island in good time… During the kayak experience, I learned to expect the unexpected because once you let your guard down, anything can happen. …My opinions towards nature definitely changed. I appreciated the feelings of serenity and purity that I notice when I was surrounded by nature and I better understand the efforts to preserve it…the overnight trip taught me that you don’t need video games, IPods, cellphones, etc. to have a good time with your friends; all you need is each other. The bus suddenly comes to a stop and fills with nervous chatter. Everyone stares out of the windows, curiously inspection the famous “Strathcona Park Lodge”…’This is it’ I think. Before I know it, my nervousness completely disappears. We start to play this new game called, “Buggies Up”. I find myself giggling as my partner, Sara, a girl I just met, races around the outside of the circle of people, heel-to-toe and heads back to me. Her expression is half way between determined and crazy as she leaps onto my back. I’m of course, no expecting her, and I stumble under her weight. We both fall to the ground and burst out laughing. People ask us if we’re alright, but we just nod, continuing to laugh. I feel my grip tighten on the rope, the rough edges digging into my palms, ‘why am I doing this?’ I ask myself. I’m standing on the high ropes platform, both my hands clenching a single rope, my lifeline… ‘Here goes nothing’ I whisper to myself as I gingerly set my first foot on the rope… I start to feel more comfortable and soon I’m really enjoying myself. I go on to finish the circuit and I come down smiling proudly. I burst out laughing for the millionth time since we set foot on the canoes. We are headed for Rainbow Island where we will be spending the night. We sing and laugh for the whole trip and it makes the two and a half hours in the canoe seem like minutes. We go swimming, explore the island, collect firewood, skip rocks, and so much more. This is definitely the most bond strengthening group activity that we have done. Many people have zip lined before, but I’m not one of them. I’m a little nervous before getting on the zip living platform, but I’m terrified once I’m strapped in, my legs dangling off the side… “It’s so high” I manage to stammer… “One…two…three!” Just like that, I push off the platform flinging myself away from the safety of the trees. I hurl towards everyone below and realize this is actually fun. I laugh as I finish and everyone cheers. A great memory and victory for the last day at Strathcona. During my Elk River hiking trip, I discovered just how clumsy I am capable of being. After you’ve scraped your knee, sprained your ankle, fallen and stumbled more times than you can count, your self-esteem gets pretty low. You reach a point where you think the only thing you’ve succeeded at doing is dragging down the other members in your group. However, even though I was getting to my last drops of confidence, I never gave up. I admit there was tears, but I never gave up and held on to the last 1% of hope than cling to what I thought was 99% of failure. I realized that it doesn’t matter if you fell 10 times, as long as you get back on your feet 10 more. By picking myself up each time I encountered a problem, I believe I showed a different kind of strength than those of my other group members. So what if I was the slowest? Even though the others were faster hikers, in the end I can proudly say I did my best. And that’s what counts.